Pressure. Expectation. Family. For people hosting Christmas lunch or dinner it’s a yuletide cocktail that is not always sweet. Although many breathe a sigh of relief when Christmas Day passes, there are a few of us who have cracked (at least, the culinary) Christmas code. From accompaniments, mains and desserts to novel alcoholic punches, here are the insights gleaned from some people who, for one year at least, have nailed Christmas. The owner of Carman’s Kitchen was in NSW’s Mossy Point with her family, about to host 15 people for Christmas lunch when she discovered the rental house didn’t have a proper oven. Lumbered with a smallish microwave convection unit instead, she sat down and spent 10 minutes reading the instructions and used a meat thermometer to turn out a perfectly roasted turkey (regular checks with a meat thermometer were key). “It was absolutely amazing, I think, because everybody’s expectations were disastrously low,” she says. Creswell’s other tips include keeping notes (including recipe tweaks and reminders) for each Christmas and setting the table early to give the impression to guests that you are on top of your game. “That was my mum’s housewife tip to me,” she says. After years overseas Melbourne chef Scott Pickett flew back from London in 2002 to surprise his Adelaide parents. On the way there, after vigorously catching up with mates in Sydney on Christmas Eve, he fell asleep in the airport lounge and missed his plane. “They woke me up at 11.30am and the flight had gone at 9am. I was freaking out,” he says. Pickett got a flight in the end and took a $200 taxi ride to his Aunty’s place in Murray Bridge. He was five hours late but his parents thought he was coming home for New Year’s Eve so it was “surprise”, mission accomplished. These days Pickett has a young family of his own and fresh prawns, oysters and cold champagne are always part of the Christmas equation. 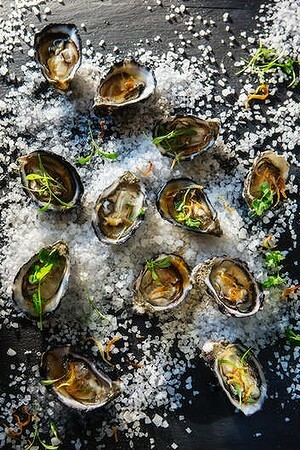 Each year he makes a simple oyster dressing by frying shallots in peanut oil and adding them to a mix of rice wine vinegar, mirin, soy sauce and sesame oil.